The West Highland White Terrier is a delightful and inquisitive breed that always finds itself in the middle of whatever is happening. The breed is one of the most friendly terrier breeds and gives a lot of affection. It can be demanding at times as well. Around other small dogs or animals, the West Highland White Terrier tends to be unfriendly. It enjoys spending time outdoors with a play session in the yard or a walk on the leash. The West Highland White Terrier is a self-sufficient dog that can have moments of stubbornness. It has a tendency to bark and dig. The West Highland White Terrier has a natural fondness for outdoor environments, but can make a good quality house pet as well. It requires a regular amount of physical activity which can include a decent to long walk or a high energy play session. It is best suited for sleeping indoors, especially if the climate is anything but mild. Maintenance of the coat requires combing a few times per week and also shaping every few months. The shaping should be done by clipping for a house pet and if it is a show dog then stripping should be done. The white coat of the West Highland White Terrier may be difficult to keep white, especially if the dog has a tendency to play outside. There are several major health concerns for the West Highland White Terrier including globoid cell leukodystrophy, Legg-Perthes, CMO, and skin disease. The minor health concerns for this breed include copper toxicosis, cataracts, patellar luxation, and KCS. On occasion, the West Highland White Terrier may experience deafness. To keep this breed healthy, regular testing of the hips, knees, and eyes is suggested. The average life span of a healthy West Highland White Terrier is 12 to 14 years. The West Highland White Terrier can attribute many of its natural hunting characteristics to the other Scotland terriers. It has shown itself to be a hunter of foxes, badgers, and other vermin as well. There was a time when the Westie, Skye, Cairn, and Scottish Terrier were all thought of as members of the same breed. Because all of these types did have considerable differences, selective breeding based on coat or color may have produced distinct adaptations that could have been sustained in specific parts or areas of Scotland. 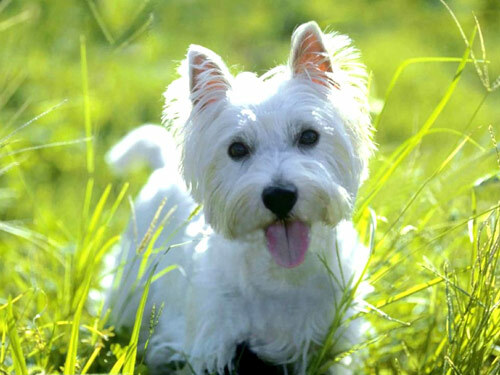 The West Highland White Terrier was originally known as the Poltalloch Terrier back in 1907. This name came from the name of the home where it had been bred by a man named Col. E.D. Malcom. The West Highland White Terrier has had many names over the years including the Roseneath, Poltalloch, White Scottish, Little Skye, and Cairn. It was originally recognized by the AKC as the Roseneath Terrier in 1908, but the name was changed to the West Highland White Terrier a year later. This breed is one of the major competitors today as a show dog and also one of the most desired terrier breeds for a house pet.